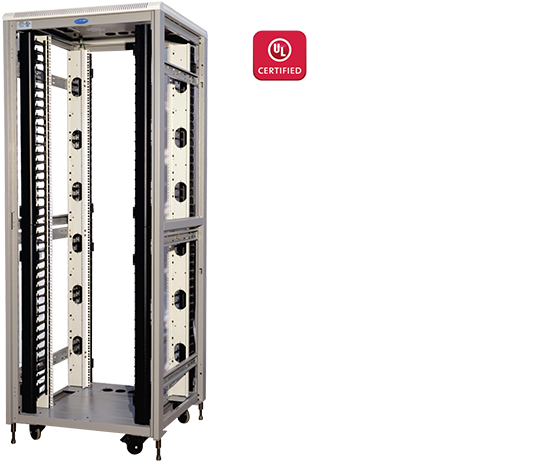 NRS Series standard for Racks configuration will be welded frame with 4 No. Pillars made of formed steel profile welded to top and bottom ribbed / reinforced frame additionally supported depth wise by 6 No depth rail 4 folded profile. Free standing on floor with 4 No. casters wheels with 2 Nos. with brakes and 2 Nos. without brakes & with levelers OR plinth. NRA Series standard for Racks configuration will be bolted frame with 4 No. Pillars made of aluminium extruded profile bolted to top and bottom ribbed / reinforced frame additionally supported depth wise by 6 no depth rail 4 folded profile. Free standing on floor with 4 No casters wheels with 2 Nos. with brakes and 2 Nos. without brakes & with levelers OR plinth. Available in 42 RU Variants with 800,1000 & 1200 Depth configurations and 800 Width configurations. Standard Mounting Caster wheels (2 with Brake & 2 without Brake) OR Levelers OR Plinth. 4 No Adjustable, 19" verticals with Punched 10 mm Square Hole and Universal 12.7mm-15.875mm-15.875mm alternating hole pattern offers greater mounting flexibility, maximizes usable mounting space.